Did you catch that? Yes, that’s right, a new acronym is born! A solution that enables the management and delivery of dynamic, targeted, consistent content, offers, products, and service interactions across digitally enabled consumer touchpoints. 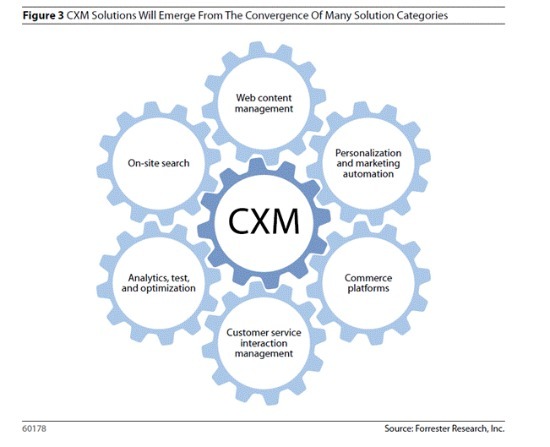 My view is that CXM is Forrester’s attempt to create some differentiation in the growing CEM technology world. So long as CXM stands for the technology space/solutions and CEM for the methodology, it just might work. 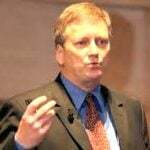 I was happy to see analyst and lead author Brian Walker also write, “CXM technologies should not be confused with the profession of understanding and leading customer experience design activities.” CEM has been a common term for the better part of a decade. Consultants have been the main driver of the CEM industry until recently, when vendors have started deserting “Social CRM” for greener CEM pastures. It’s a good high-level report by Walker, who covers e-commerce and related areas in rich media, SEM/SEO, dynamic content delivery and so on—a background that may explain the digital slant for CXM which you can see in this diagram. What I liked most about the report is that it attempts to create a technology framework organized around a business goal (digital customer experience) that spans multiple technology categories. All too often analysts tend to stick to the silos they cover, which is aligned with a category of paying vendor clients. At a minimum, it should help digital experience strategists and maybe CMOs think about how the multi-channel experience should be managed, to create a pleasing user experience. Perhaps a more commonsense term for what Walker writes about would be Digital Experience Management. There is a nod to customer service interaction vendors — which includes vendors that offer web self-service like eGain, Moxie Software, Parature and RightNow. Otherwise, the CXM solutions discussed are mainly in the digital marketing fields, such as commerce platforms from IBM/Unica, web content management from Adobe, or web analytics from Webtrends. All that said, I was disappointed to find that CEM — oops I mean CXM — didn’t include any mention of Voice of Customer or, as some vendors like to call it, Customer Experience Analytics. Now, I’ll be the first to say that VoC deserves its own treatment. That’s what lead me to write my recent article about the Next-Generation Voice of Customer Command Center. Understanding digital feedback (e.g. web analytics) is included in 6 dimensions I discussed. An experience that truly stands out from the competition, and builds customer loyalty. CEM strategy/design consultants shine here. Delivery and multi-channel orchestration capabilities. This is everything from tools to people on the front lines. VoC analytics and feedback management. You can’t improve the experience if you don’t understand how customers/users perceive it, and act on their input. Kudos to Forrester for breaking out of the digital silo thinking, and helping e-business leaders think about the bigger picture. All in all, this is a useful although not entirely groundbreaking report on how technology solutions can help deliver better digital experiences. Actually, Customer Experience Management and the acronym CXM was born in 2002 by defunct, but still widely know, e-consulting firm iXL, which merged with Scient in 2002 and was renamed iXL/Scient. I had the wonderful opportunity to be a consultant on the CXM team, delivering the highly innovative program to FedEx and Corporate Express (now Staples).